We all feel it, our smartphones grab more and more of our time, changing us in subtle ways over the years. For well-reasoned counsel to help us thrive under the new pressures of the digital age, 12 Ways Your Phone Is Changing You is a wonderful help, in these 12 ways. 1. The book is God-centered. Many technology books lack any serious talk about God — his character, his word, and his Son. But this book clearly addresses the questions of the digital age with a solid awareness of the Creator and his full intent for creation. God created us to enjoy him. God has also created a myriad of means, including the technological progress of the digital age, to help us enjoy him more. God governs over all technology, and this book shines the light of God’s sovereignty over the technological age. 2. The counsel of the book is wisely nuanced. Different readers will need to hear different messages, and the author is firmly aware of it. “So I cannot tell you to put your phone away, to give it up, or to take it back up again after a season of burnout,” Reinke writes. “My aim is to explore why you would consider such actions in the first place” (21). Given the diversity of our smartphone habits, we are called to carefully understand our own personal wiring. 3. From the first page, the back-and-forth nature of our smartphone habits is made humorously clear. This is not a one-sided book (pro-phone or anti-phone); it balances our habits well. As the preface begins: “This blasted smartphone! Pesk of productivity. Tenfold plague of beeps and buzzing. . . . Yet also my untiring personal assistant, my irreplaceable travel companion, and my lightning-fast connection to friends and family. . . . This blessed smartphone!” (15). The spectrum of what we do with our phones — from scrolling through witty response GIFs, to our nested conversations on Twitter, to personal productivity apps, or using pixels and podcasts to feed our souls — all of it is on the forefront in the book. 4. The message of the book is passionate, and not muted by drab truisms. For example, chapter three (on our craving for immediate approval), ends with this warning: “As we fight against the lure of self-glorification, Jesus, Paul, and Peter all plead with us: don’t waste your approval. Don’t crave the approval of man online. Don’t flaunt your righteous deeds in the cyber world. If we miss their warnings, we will make a cosmically foolish mistake, with eternal regret to follow” (78). The book is sometimes humorous, sometimes serious — but always earnest, with eternity in view. 6. The book raises a lot of questions for personal evaluation, and those questions are theological and practical. There are suggestive helps for self-criticism, to help think about our own patterns of behavior, but they always come back to concrete and applicable questions. Using Paul’s guidelines in 1 Corinthians 6:12–13 and 10:23, the book asks us to think about our smartphone habits in three ways: (1) What is the end and aim of my life? (2) How am I influencing others? (3) Does my phone serve me, or do I serve my phone? Answering each of these three questions will revolutionize your habits by bringing clarity to your priorities. 7. The writing style in this book is delightful. Apart from the introduction (“A Little Theology of Technology,” which is panoramic in scope, but also too brief and perhaps a bit clunky), the prose style of the book is enjoyable, memorable, and beautiful. “Life online is a whiplash between deep sorrow, unexpected joy, cheap laughs, profound thoughts, and dumb memes. Our social media feeds give us what is sometimes riotous, sometimes amazing, sometimes dizzying, and sometimes depressing. But the disjointedness is something we have welcomed on ourselves” (178–179). Quotable gems like this are scattered on just about every page. 8. The book is thoroughly researched. 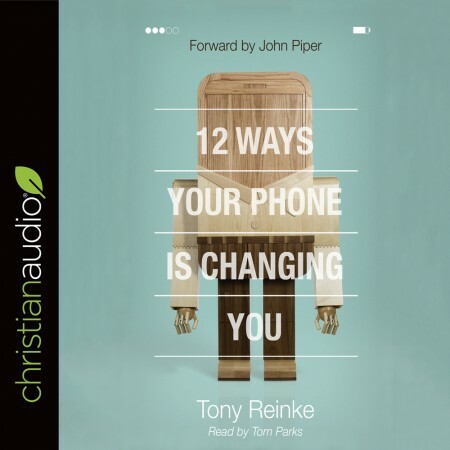 Over the course of three years, Reinke — an author and the host of the Ask Pastor John podcast — crafted a couple dozen interviews with some of the most influential Christian thinkers. He also read about 50 books on technology and over 1,000 articles on smartphone research, all while keeping his attention focused on the spiritual effects of our habits. The result is what you would expect from a respected researcher and journalist. Reinke skillfully packages his far-reaching findings in a way that is concise and engaging. 9. The book focuses on eternity. There’s no shortage of books and studies on the physical and psychological effects of screen-time on our lives, but this book focuses on the long-term, the long-est-term — the eternal consequences of our smartphone habits on our souls. This is what makes the book most unique. Our phones demand our attention, and we willingly give our attention to them. But what do we really want? And what does that say about our own desires and cravings in our hearts? The goal of the book is simple: To get us “to move from being distracted on purpose to being less and less distracted with an eternal purpose” (52). 10. The book’s tactics are holistic: it appeals to our heads, our hearts, and of course our thumbs. But it is also balanced: it speaks to both digital consumers and digital creators. Do you need intellectual arguments and data and research? Do you need appeals to your longings and answers to your fears? Do you need immediate practical changes to your phone habits? Do you need inspiration to use social media for a strategic purpose? The book has them all. 11. The book is communal. Reinke is skilled at breaking through norms to show how, for example, our social media habits obligate others. “If I’m a social-media junkie, my lack of self-control feeds the social-media addiction in you,” he writes. “And the more I text and tweet and Snapchat, the more I drag you and others into the digital vortex of reciprocating obligation. This is the secret to how social-media giants grow their valuation into the billions. They need me to entice you” (198). This fresh perspective helps break us from the individualized consumer model that the personal electronics industry is built on. On the flip side, we need one another. We need to find our place in healthy local churches, and to that end, I can see this book being a great one for group discussions with church leaders and small groups, to talk about smartphone behaviors and to brainstorm personal changes for healthy Christian living. 12. Finally, the book’s cover image is epic! As explained in the acknowledgments, the iPhone guy on the cover stands 6-feet-tall and weighs 250 pounds! Designed and cut from hardwood and assembled by a guitar maker. Take up 12 Ways, read it, discuss it, and challenge one another as you pray that God will use this book to change us in profound ways, all for the goal that God will grow more and more glorious to our eyes.